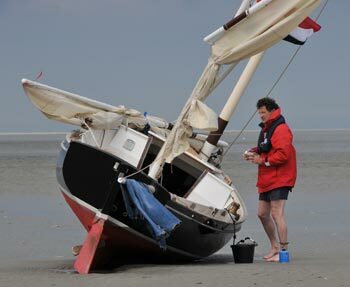 Errit Bekkering has a lovely inboard engined Romilly that he sails on the Waddenzee. As you can see from the picture he needs some beaching legs. Drawings of beaching legs were provided with boats for DIY completion but I guess that new owners of complete boats never received these. Errit bought his Romilly from a brokerage in Lymington and planned to launch his boat from the trailer but was advised by a trailer engineer who did some modifications to his trailer that “due to the shape of the hull trailer launching would never work. Errit ended up having his boat craned in. 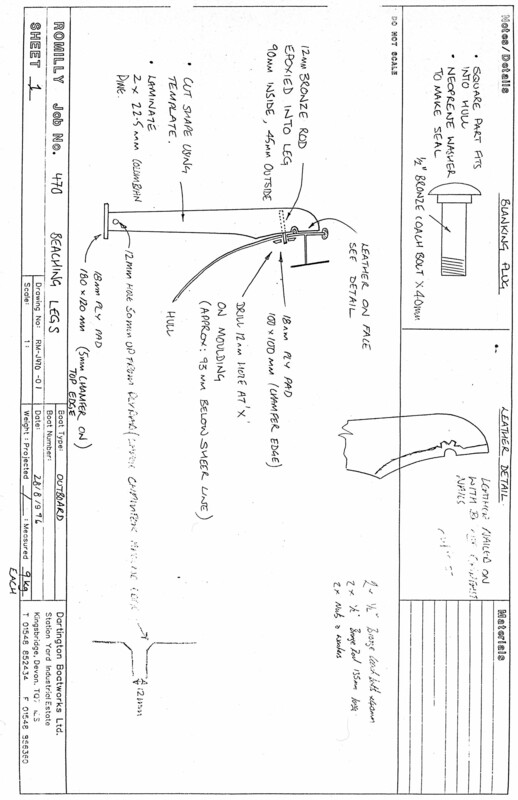 Errit has had a stay sail made and we look forward to his report on its use when he has had the need to use the sail. I have legs for my boat which I made from Nigel Irens’s drawings. They work well and have given me no problems. The comment on Romilly’s trailerability is interesting – and I don’t understand it. What could be so special in the shape of her hull, that trailer launching would never work? Is there a Romilly owner out there who has first hand experience in this topic? I have a trailer and can confirm that the Romilly launches very easily from a trailer. Much easier than a Flying 15 (which I also owned for a short while) for example. If there is a jetty next to the slip you don’t even need to get your feet wet. The one concern I had was controlling the mast while I got it into the slot. In the end I made an A frame which allowed me to fit the mast on my own. I’ve never tried it but I’m told some people remove the mast by simply dropping it over board somewhere away from other boats, pull it on board and motor in. In short there is no problem with launching from a trailer (at least from my Lizard piggy back trailer). Using the Lizard piggy back launching/road trailer combination I used to launch and retrieve Riant at the start and end of each season without any problem. Given a calm day it was possible to put up the mast single handed by tying a loose strop around the foot to each panama. This gave something to lift against and pivot the mast to the right angle for the socket. A bit like caber throwing. And yes, on our maiden sail the main halyard got into such a “wringle” that I could not lower the sail and had to just throw everything overboard in order to “unwringle”. The problem had been caused by swivel blocks and some twist in the main halyard.